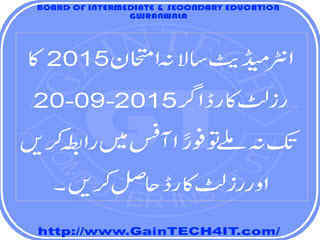 If you not received Result Card Inter Annual Examination 2015 at you given address (as private students) or at your institution addresses (as regular students), till 20-09-2015, you should contact BISE, Gujranwala Board immediately. After few dates office will charge duplicate fee for duplicate card. But if you contact immediately you will receive your result card free of cost.